I recently watched the movie, "Finding Forrester," starring Sean Connery and Rob Brown. The Connery character is a well-known but reclusive novelist (hints of J. D. Salinger) who reluctantly mentors a young basketball player who has literary talent. 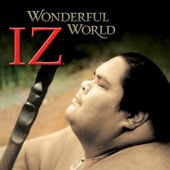 At the end, the credits roll to the music of Israel Kamakawio'ole playing a ukulele and singing a medley of "Somewhere Over the Rainbow" and "What a Wonderful World." Even though the songs are hopeful, tears came to my eyes. I was puzzled by my reaction. Why would I have poignant feelings over happy music at the end of a happy movie? I first heard "Over the Rainbow" when I was a boy over 50 years ago. My father was in the Army and had just left the family to serve in Korea. I was lying in bed one night when I heard a woman's voice - Judy Garland? - singing the song on television. The hopefulness of the song was mixed with sadness caused by my father's absence and fears about what could happen to him. At that age, a year is a long time. At some level, I recognized that hope might be a feeling you long for when things don't seem so hopeful, and I began to cry quietly to myself. Ever since then, "Over the Rainbow" has seemed like a sad song to me. Interesting. The linkage between that song and my feelings had been in my brain all those years, persisting to this day. Also, it triggered the reaction even though I wasn't consciously aware of the association. The brain is what I like to call "the learning instrument." Learning is a survival mechanism. If we didn't learn, each day when we get up in the morning we'd have to figure everything out from scratch all over again. If we had to do that...well, it just wouldn't work. We survive and prevail because we learn. We remember facts, concepts, procedures, skills, habits - and how we feel about things. When something frightens us, if we want to survive we better remember the association. The problem is, the human brain doesn't have a delete key. So even if I didn't consciously relate music to my experience, and even if those associations are ancient and strange to me now, they still bubble up in my brain from time to time. For example, a lot of the rock music of the late 60s and early 70s still has the power to trigger the same feelings I had during that time of war and social unrest - even if they are irrelevant to my life today. Other music that moves me: Samuel Barber's "Adagio for Strings" (remember the movie, "Platoon"? ), the second movement of Beethoven's 7th Symphony, and Bedrich Smetana's "Die Moldau." And many more classical pieces. Lots of early rock music. All this stuff calls up old images and memories that stir my feelings. Music has this power. Music is a language of emotion. Language is the foundation for logic, the organizing principle of the left side of our thinking brain. Music performs a similar function on the right side. Music, along with the other arts, is one of the ways we express emotions. Music never expresses logical significance. It links with other perceptions to express emotional significance. Cognitive scientists believe that the pace, tone and intensity of a musical composition trigger specific feelings in the brain. Composers understand this. Symphonies, pop tunes, movie themes, and TV ads. If they want you to feel sad, they know how to do it. If they want you to feel joyous, they know which buttons to push. If they want you to feel larky and accepting, they have the tools to do so. Music is everywhere. People can't get enough of it. They walk around with little wires in their ears so they can listen to music anytime, anywhere. My DirectTV gives me 75 channels of it 24/7. The magical ability of music to create associations and color our moods operates below the level of conscious awareness as we move through the day. And there's nothing we can do about it. Except this: we can choose the kind of music we listen to. We can hit the mute button. And these days, oh my brothers and sisters, I'm a lot more selective. Great post, Denny! I think "Over the Rainbow" IS a sad song. It's about a place you can never get to, or an ideal you can never fulfill. But I know what you mean about associating songs with experiences and feelings. Hi Denny, You struck a chord with this topic. Thanks for your insights and for sharing your personal reflections on how powerfully music affects us. On this topic, I was just writing about how we are all natural singers, and how singing taps into the very essence of what makes us human. Best wishes to you and the kits! I've been very careful about what music I subject myself too as well. This began shortly after Nina Simone's version of Strange Fruit practically destroyed my love of walking by the river where there is an abundance of poplar trees. Israel's medley has always been a happy song for me, magnified tremendously when I saw Finding Forrester. One of my jobs as a performing musician is to remind audiences of all ages that the music they listen to has a profound influence on their minds, spirits, souls-Aristotle noted that "The ear is the door to the soul. "-In my "Stay Young With Mozart" program, attended by audiences ages 1 to 101 in public libraries, this is the central focus. In this post, you have brought forth an invitation to your readers to examine this dimension of music - It is an important service....I wish you many attentive readers, and will send this post on to others. You're not the first to have Izzy's inspired mash-up of those two beautiful songs move you, with or without the associated remembered emotions. Izzy knew he'd hit on something special when he called for the middle of the night recording session. Even though it was years ago my post about this song, Stopped In My Tracks, remains frequently visited by so many searching the internet for information about that song. And Platoon changed my life, but that's another thing altogether. "Over the Rainbow" as sung by Israel Kamakawio'ole always sat peacefully in my mind. Then when my cousin died a few years ago, the song was used in a picture vignete of his life. The song has never been the same for me. I tear up every time. True the mind don't hav delete button,n most music takes us in a virtual world n make us forget reality.I mire choose to wht I listen as to wht I eat.